Triple Drift Clouds for constantly moving, shifting, drifting soundscapes • Massive modulation possibilities – including pitch, filter, amp, grain and stereo pan: this synth was built for stereo! 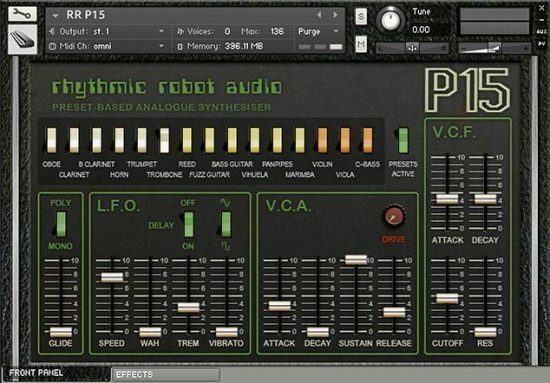 • Core waveforms from classic machines, both analogue and digital, combined in drifting pairs to form sweeping clouds of sound • Glitch Control with finetuned parameters that home in on cool pad textures with one click • In-depth control set for hardened tweakers, or one-click patch creation for instant gratification! There are lots of evolving chewy pads to be had here. The presets are generally quite interesting and diverse. 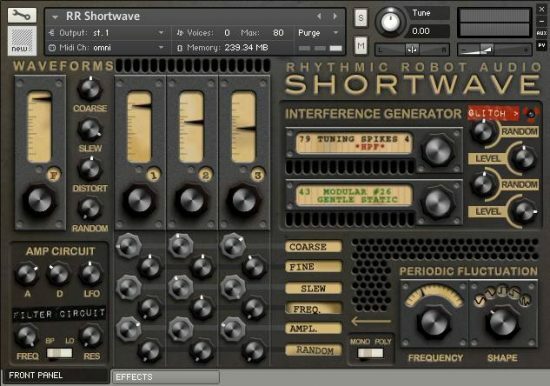 Since the samples are all loaded at once it is faster to vary your sound by just sliding between the sound sources (1,2,3) quickly for subtle tweaks, or by clicking on the glitch button for more drastic changes. Thats’s faster than waiting for the samples to reload all over again between presets. 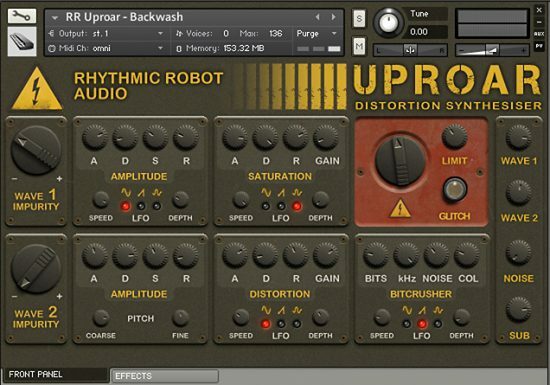 It’s great that reverb is there as one of the effects choices. 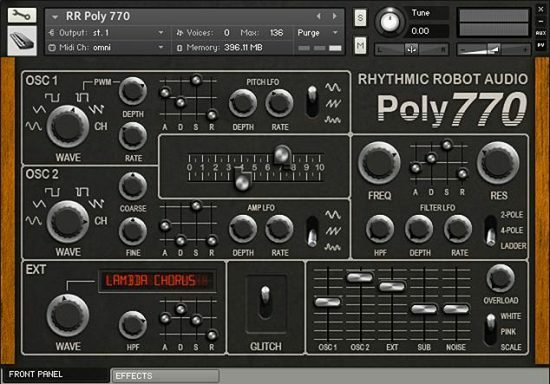 It would be even better if there was more than one reverb type available in the GUI. That said, I can spend hours glitching away and creating and saving new fantastic useful presets. Pad lovers dive in a deep pool! 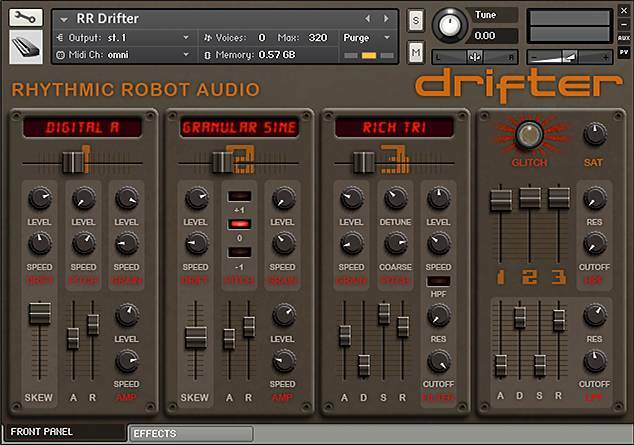 Drifter is humming away right now in the background, chewing on a midi loop I cooked up just to test its sensuous chops, and it is a splendid machine! Once again glitch/rnd shies through in this one, paving the way for endless experimentation. The core sound itself is rich and sharp, like a pad should be, but it still has the ability to surprise you. There is some tin in its bite, so I will definitely experiment with warming its sound, but probably through the mod wheel so I can bring up that soaring sheen so deeply baked into the thing. Absolutely recommended for the pad-lovers among us. I drift alone and shift with the sands of time by my side. There is a signpost up ahead. Where was I? Another marvel designed by our mentors and I quote them: The Professor and Mongo. I just buy it at a more than democratic price. It’s the least we can say. But can assure you one thing: tomorrow after my morning coffee, I’ll rush on Kontakt and I will try Drifter, The ultimate pad synthesiser! Do the same if you can. I am absolutely convinced that these sounds of the 80s, will soon return to the top of the music scene. This is the ultimate machine! Never have I heard such rich mixtures of the past, present, and future. You guys have thought of everything. Congratulations!